When MGM National Harbor opens in the fourth quarter, visitors will discover a permanent collection of high-quality art seamlessly integrated into the resort’s public spaces. Inspired by the rich heritage of the Capital Region, the MGM National Harbor Heritage Collection will showcase commissioned and procured works by visionary local and international sculptors, photographers and mixed-media artists, including Margaret Boozer, Alice Aycock, Sam Gilliam, John Dreyfuss, John Safer, Liao Yibai and Chul Hyun Ahn, among others. 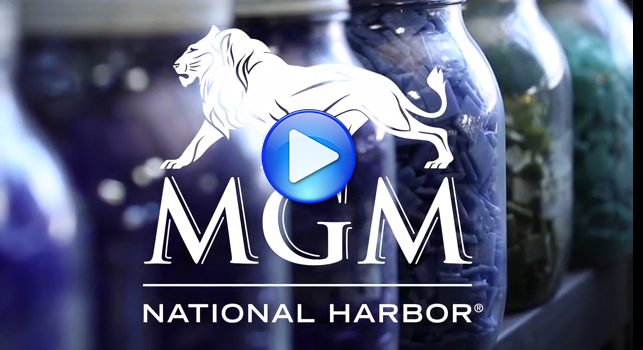 From the moment guests arrive at MGM National Harbor, situated on the shores of the Potomac River in Prince George’s County, Maryland, they will encounter a sensory experience unlike any other. From the three, 60-foot-tall stainless steel figures of the Unity sculpture greeting visitors at the hotel’s porte cochere, to the whimsical seven-foot-tall Cinderella Shoe in the retail promenade, guests will be immersed in a storyline unique to the property. Every aspect of the art - from the piece to the location to the orientation - has been carefully selected and strategically designed to complement the space. The artwork will evoke a sense of wonder and delight as guests wander through the resort, encountering works that are diverse and approachable, rivaling the quality and caliber of masterpieces displayed in public collections throughout the Capital Region. The MGM National Harbor Heritage Collection will feature pieces from more than a dozen artists working with a variety of mediums including aluminum, clay, stainless steel, bronze, watercolors, photography and more. Objects will range from large-scale sculptures and paintings to photography and LED light boxes, creating a rich visual experience. Some works, like those by Madelyn Keesing and Sam Gilliam, are abstract pieces which echo the historical visual art movement of the Washington Color School that originated in Washington, D.C. Commissioned pieces by emerging artists reflect the rich heritage of Prince George’s County and the greater Mid-Atlantic region, such as the landscape composition fashioned from construction site clay by Margaret Boozer of Red Dirt Studio. Specializing in modern monumental sculpture, this Washington, D.C. artist’s work will welcome guests as they arrive at the hotel entrance. John Safer, an internationally renowned sculptor throughout the latter half of the 20th century, was also a successful entrepreneur who went on to become a major figure in banking. The New York Times compared Safer’s position as a sculptor to that of Georgia O’Keeffe as a painter and Ansel Adams as a photographer. The U.S. Department of State sent Safer’s sculptures abroad to be exhibited as an example of America’s finest art. His works today stand in over a thousand private collections and public sites and have been exhibited in museums, galleries and embassies around the world. Ascent, a 75-foot-tall work, described as one of the great public sculptures of our time, stands at the entrance of the Smithsonian Institution’s National Air and Space Museum at Dulles Airport. At 90, Safer continues his craft. He works with his stepdaughter Kathryn Scott, to whom he taught his trade and offered his mantle. Safer and Scott collaborated on a monumental work, Quest, for the Johns Hopkins Wilmer Eye Institute. The 35-foot-tall stainless steel sculpture is one of the largest works of art that Johns Hopkins has received. Alice Aycock, a prominent New York sculptor, has exhibited in major museums and galleries nationally as well as in Europe and Japan. Her works can be found in numerous collections including the Museum of Modern Art, the Whitney Museum, the Brooklyn Museum, the L.A. County Museum, the National Gallery of Art, the Sheldon, Storm King Art Center, the Louis Vuitton Foundation and the Sprengel Museum in Hanover, Germany. She also exhibited at the Venice Biennale, Documenta VI and VIII and the Whitney Biennial. Her large-scale installations can be found at numerous universities and in many public buildings in major cities across the United States. Sculptor and ceramicist Margaret Boozer, a resident of Prince George’s County, Maryland, will use soil taken directly from MGM National Harbor’s construction site to create a wall-mounted interpretation of the environs of National Harbor. Boozer developed an interest in digging native clays that led to collaborations with soil scientists and work exploring intersections of art and science. Her work is included in the collection of the Smithsonian American Art Museum, The U.S. Department of State, The Wilson Building Public Art Collection and in many private collections. Boozer taught for 10 years at the Corcoran College of Art and Design before founding Red Dirt Studio in Mt. Rainier, MD where she directs a ceramics and sculpture seminar. Recent projects include a commissioned installation at the U.S. Embassy in Djibouti. Ronald Beverly is a photographer/digital imagist residing in the Capital Region for more than 30 years. His academic studies produced a BFA from Howard University and an MFA from George Washington University. Inspired by the masters of large format work, Beverly developed a sensibility toward texture and detail by emphasizing tactile quality of the elements within the photographic composition utilizing digital imagining enhancement techniques. The desire to capture and finesse the elusive quality of light is also a reoccurring characteristic in his work. Over time, Beverly pursued a commitment to the craftsmanship, aesthetics and philosophies of photography while bridging the gap between conventional film and digital image capture. The inspiration for the MGM National Harbor work stems from his passion for the landscape and has been the training ground in acquiring his skills as a photographer. The serenity, hidden beauty and dynamics of nature provide endless opportunities in showcasing its potential. Charles Dwyer is an American painter who specializes in watercolors and mixed media depicting the female form. Combining a strong abstract and design foundation with minutely and sensitively observed figure studies, Dwyer is able to create stylistically unique pieces. Typically, to arrive at his finished works, Dwyer positions his model within a complete tableau, which includes costume design, make-up, backdrops and props. He then captures the image using a camera with a 6” x 7” or 4” x 5” frame. This is the starting point for an individual and idiosyncratic exploration of the image in which color, pattern and art historical and pop culture references are combined with Dwyer’s exquisite drawing skills. Dwyer is an avant-garde artist in every sense of the term, and for this reason, his artwork is widely sought after by galleries and collectors. The unexpected imagery found in Dwyer’s elegant, almost classical female forms provoke endless interpretation and exploration. Liao Yibai is a Chinese artist who creates hand-welded stainless steel sculptures that question today’s skewed concept of value by depicting China’s rags-to-riches story of material obsession. The oversized sculptures of watches, rings, handbags and high-heel shoes confront the multitudes of popular brands and logos and their overwhelming presence in today’s society. The artist’s works illustrate the challenges he faced during childhood, and his paralleled fascination with American culture. The work examines this increasing obsession with opulence and luxury goods while discrediting and glorifying it simultaneously. Yibai is inspired by China’s lucrative fake antique industry as well and the ubiquitous “Made in China” tag which adorns a majority of imported goods in the U.S. The artist’s work has been exhibited internationally and has garnered press worldwide in The New York Times, ARTnews and Sculpture Magazine, among others. Through the interplay of mirrors and light, Baltimore-based artist Chul-Hyun Ahn makes mind-bending sculptures that conjure illusions of infinite space. Drawing from light and space traditions, as well as theories of the subconscious, Ahn explores the immersive, illusory possibilities of reflection. He creates his light boxes by combining one-way mirrors and LED lights; the resulting objects look like portals extending deep into uncharted spaces, defined only by glowing geometric forms and fluorescent fractals. An American pioneer of hard-edged shaped canvases, Charles Hinman’s work received immediate global acclaim in 1964–1965, with work at Sidney Janis Gallery and a one-person exhibition at Richard Feigen Gallery. Major works found permanent homes at MoMA, the Albright-Knox Gallery and the Rockefeller Collection. Hinman’s work foreshadowed and influenced an important generation of artists. There have been numerous museum shows in the years since, including at the Everson Museum and three at the Butler Institute of American Art. He has received many awards, including from the Pollock-Krasner Foundation, and is a current recipient of a Guggenheim Fellowship. Hinman’s array of sculpted canvases energizes the space on surrounding walls. Various facets of his new white-primed rhomboids and diamonds are painted behind, or in front, in bright, saturated hues creating a fascinating play between literal and illusionistic depth. In some shaped canvases, colors are reflected off the wall, thus allowing for the wall and the interstices to be reconsidered as foreground and ground. In other works, bands of bent colors are best viewed from the sides. As one moves around the work, it is perceived differently. New colors, new facets, new forms, and new shadows emerge as the work is constantly reinvented. A pillar of the Washington, D.C., modern and contemporary art communities, internationally acclaimed abstract painter Sam Gilliam has been testing the boundaries of color, form, texture and the canvas itself over the course of his long, productive career. Filling canvases with fields of deeply saturated color and layers of expressionistic brushstrokes, both subtle and bold, Gilliam was a part of the Washington Color School (late 1950s - mid-1970s) and has been associated with the Abstract Expressionists. Ever the innovator, he took his color-stained canvases off of the stretcher in the late 1960s and presented them in radical new ways: draped across walls and hung from the ceiling in generous, folding layers. These sculpture-painting hybrids have become a defining part of Gilliam’s practice and inflect all of his work with an ongoing exploration of the depth, physicality and resonance of color. Martha Jackson Jarvis’ sculptures have been exhibited in solo and group exhibitions in galleries and museums throughout the United States and abroad, including the Corcoran Gallery of Art in Washington, D.C.; the Studio Museum of Harlem, NY; Snug Harbor Cultural Center in Staten Island, NY; Southeastern Center for Contemporary Art in Winston-Salem, NC; Anacostia Museum in Washington, D.C.; and the Tretyakov Gallery Moscow, USSR. Jackson Jarvis grew up in Lynchburg, VA and Philadelphia, PA and currently lives and works in Washington, D.C. She studied at Howard University and received a BFA from the Tyler School of Art at Temple University and a MFA from Antioch University. Jackson Jarvis also studied mosaic techniques and stone cutting in Ravenna, Italy. Her current design’s inspiration incorporates reflections of the Potomac River in abstract content. Local sculptor John Dreyfuss will feature a series of six bronze pieces to be deployed on the West Terrace, reinforcing the view of the Potomac River and neighboring communities from the outdoor plaza. Dreyfuss employs classical tools and techniques to create works in bronze, steel, iron, and, more recently, composite materials used in the aerospace industry. His work is grounded in the study of animal and architectural forms, with an emphasis on the refinement and adaptation of three-dimensional structures over time and space. Dreyfuss has exhibited extensively in the United States and abroad. His work is represented in the collections of AT&T Cellular Communications, Los Angeles, CA, Hunter Museum of Art, Chattanooga, TN, and J.W. Kaempfer Development Corporation, Washington D.C., among others. Terry O’Neill is an English photographer best known for his candid celebrity stills. His photography career began at the age of 22 and he was soon freelancing for Vogue, Paris Match and Rolling Stone magazines. He worked alongside photographers David Bailey, Terence Donovan and Patrick Lichfield, who helped create the images that defined "Swinging London" of the 1960s. O’Neill’s Hollywood film connections helped contribute to his immense success internationally. He photographed celebrities from the Beatles and the Rolling Stones to the Royal family and Hollywood stars. MGM National Harbor is in collaboration with the Prince George’s County Arts and Humanities Council, an independent non-profit organization designated by the Prince George’s County government to coordinate financial support and advocacy for the arts and humanities through grants, artistic programs and creative partnerships among business, education, government and residents. For the Heritage Collection, MGM National Harbor has also partnered with Atlantic Arts, a Maryland-based art procurement company, and RareCulture, a women-owned establishment specializing in curating fine art collections. For additional information, please visit newsroom.mgmnationalharbor.com. The newest addition to the MGM Resorts International (NYSE:MGM) portfolio, MGM National Harbor’s unrivaled setting offers stunning panoramic views of the eastern shore of the Potomac River in Maryland. The $1.3 billion resort sits a short distance from Washington, D.C. to the north and historic sites, including George Washington’s Mount Vernon estate across the river in Virginia. The 24-story, 308-room resort will feature premier amenities and experiences for locals as well as visitors from around the world including a dynamic casino with over 125,000 square feet of space that includes slots, table games and poker; a world-class spa and salon; an entertainment theater with flexible seating for up to 3,000; high-end branded retail; 27,000 square feet of meeting space; and restaurants from renowned local, national and international chefs. MGM National Harbor is slated to open in the fourth quarter of 2016. MGM Resorts International (NYSE: MGM) is one of the world’s leading global hospitality companies, operating a portfolio of destination resort brands including Bellagio, MGM Grand, Mandalay Bay and The Mirage. The Company is in the process of developing MGM National Harbor in Maryland and MGM Springfield in Massachusetts. The Company also owns 51 percent of MGM China Holdings Limited, which owns the MGM Macau resort and casino and is developing a gaming resort in Cotai, and 50 percent of CityCenter in Las Vegas, which features ARIA Resort & Casino. 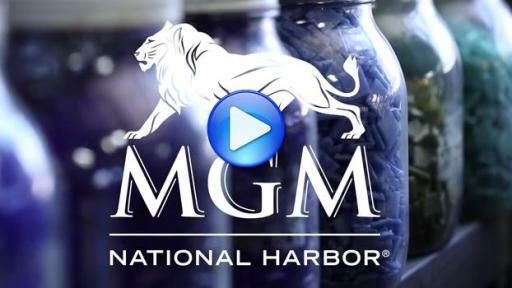 For more information about MGM Resorts International, visit the Company’s website at mgmresorts.com.